In the nearby Universe, massive elliptical galaxies contain very little interstellar gas and old stellar populations. As such, they are commonly called “red and dead” galaxies (the high-mass stars have already evolved off the main sequence, leaving only the low-mass, red, stars). But the evolution of these massive and passive galaxies are hard to explain using theoretical models. In fact, most models expect nearby massive galaxies to have much younger stellar populations, as opposed to old. How do we solve the discrepancy between theoretical models and observations? Most models invoke massive quasar outflows, which prevent the gas from coalescing in order to form stars. Quasars are characterized by their accreting supermassive black holes. The extreme influx of material falling into these black holes provides the luminous power source observed as point sources. In other words the gravitational potential energy is converted into luminous energy. Given that quasars are fueled by infalling material, what is the physical mechanism that might drive such a massive outflow? The light emitted by the quasar exerts radiation pressure on the surrounding gas. In a few, extreme situations, this is strong enough to expel the gas from the galaxy. The stars and dark matter however remain relatively stable within the galaxy, as they are so much denser than the gas itself. This results in the massive galaxies observed today, which contain old stars, dark matter, and no interstellar gas. 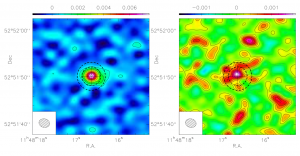 The finding in 2004 (Cimatti et al.) that such massive and passive galaxies existed not only in the nearby Universe, but at z ~ 2, when the Universe was only 3 billion years old, implies that such quasar outflows needed to occur very early on. Allowing time for the outflow to truly rid the quasar of gas, such outflows would have to occur at z > 6, near the reionization epoch. Evidence for early quasar outflows came recently when Maiolono et. al observed the distant quasar: SDSSJ114816.64+525150 at a redshift of z=6.4189. While quasars are characterized by their broad emission lines (the Doppler effect widens the lines as the infalling material in the immediate surroundings of the black hole orbit rapidly), these lines reveal little about the motion of the interstellar gas farther out in the quasar’s host galaxy, and therefore the possibility of an outflow of gas. The trick is to measure emission lines associated with molecules that are not present in the nearby vicinity of the black hole. At sub millimeter wavelengths there are several ionized carbon emission lines that may be observed. Carbon monoxide molecules exist only in cool environments, far away from the hot gas surrounding the black hole where they are quickly broken up into their components. Maiolono et. al adopted this approach, and conducted their observations using the Plateau de Bure Interferometer located in the French Alps. Figure 1 – The continuum subtracted spectrum of the CII 158 micon line. The red lines show a Gaussian fit with a FWHM of 345 km/w and a FWHM of 2030 km/s. The blue line shows the sum of the two Gaussian profiles. Figure 2 – Map of the continuum – subtracted CII line. The left figure depicts velocities between -300 and 400 km/s, while the right figure depicts velocities between 400 and 1300 km/s. The dashed circles represent the extraction apertures of the two spectra. The color bars give the average flux density. The far-IR emission inferred from the sub-millimeter observations reveal large outflows of gas. The spectrum (figure 1) shows a clear emission line, CII, at 158 microns. A single line will be broadened due to the Doppler effect as velocities moving toward and away from the observer cause the line to be both redshifted and blueshifted. Thus the observed CII line reveals broad wings, which are indicative of a powerful outflow. Material moving within a large galaxy is expected to travel at a relative (with respect to the galaxy) velocity of a few hundred km/s. The material presented here flows out at speeds of up to 2,000 km/s. 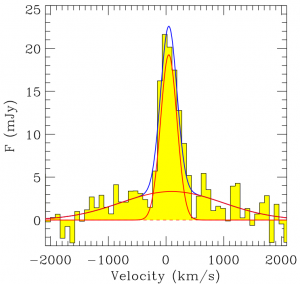 Not only may this outflow be inferred from the quasar’s spectra, but it is also visibly extended in a few images (figure 2). The images are characterized by a compact core and diffuse emission surrounding the source on a scale of a few arcseconds. The outflow is marginally resolved, to approximately 16 kpc, implying that the outflow can actually affect the entire galaxy. This is the largest outflow yet discovered. Assuming that the outflow occurs uniformly in a spherical volume, the authors find the galaxy loses 3500 solar masses per year, or 10 solar masses every day! The molecular gas content in the host galaxy, as inferred by CO observations, is 20 billion solar masses. At the observed outflow rate, the quasar host galaxy will be cleaned of its gas content and therefore quenched of star formation in 6 million years. Thus, this outflow is massive enough to result in a red and dead galaxy by z ~ 2. While we can’t continually observe this process for the next 6 million years, it is very likely the gas will continue to dissipate into the intergalactic medium leaving the old stars and dark matter behind. What is now a very luminous quasar will eventually become a massive and passive galaxy. The findings presented by Maiolino et. al strongly support that massive outflows occurred early enough (z > 6) to have cleaned the galaxy of gas and therefore quenched star formation by z ~ 2. This model may be further confirmed by finding evidence of strong outflows at lower redshifts (2 < z < 6).